Established in 1964, WCER is one of the first and largest university-based education research and development centers in the world. Its researchers and staff work to make teaching and learning as effective as possible for all ages and all people. WCER’s research began with an emphasis on the human mind and motivation, contributing to the rise of cognitive psychology. Math and science learning soon became a core activity. Much of the center’s current research focuses on investigating diverse learners, conducting assessment and evaluation, exploring solutions for the opportunity gap and providing educational support for English language learners. For more than five decades, WCER researchers from many disciplines have focused on the problems of learning, teaching, assessment and policy in today’s education systems. They collaborate with teachers and administrators to ensure their research focuses on important problems of practice. 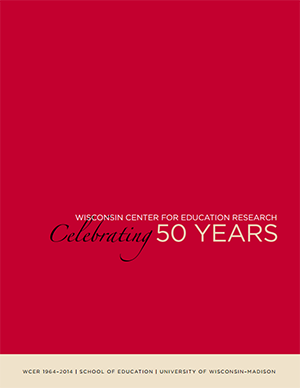 More details about WCER’s history is available in the center's 50th anniversary booklet. Download this publication to learn more about WCER's beginnings and contributions to advancing education through research.